Dance Classes, Lessons, Events & Courses for Strictly Jitterbug! 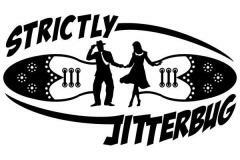 Dance Classes, Lessons, Events & Courses for Strictly Jitterbug!. Event Organiser, Private Coaching, Regular Dance Classes, Instructor for Hire, Workshops. Dance Styles: Rock 'n' Roll, East Coast Swing, Jive (50s & American), Jitterbug, Lindy Hop, Swing Dance, Jive, Charleston. All major Credit Cards accepted. All Entries for Bedworth Ex Servicemens Club Venue. Car Parking. Stage. Rock 'n' Roll, East Coast Swing, Jive (50s & American), Jitterbug, Lindy Hop, Swing, Jive, Charleston Instruction at Complete Novice to Improver level, Practice at Beginner to Improver level, Social Dancing at Beginner to Intermediate level. Doors open 19:30. Admission £7.00. £35.00 for whole evening. Licensed Bar. Non-Alcoholic Bar. To book or for further details: Tel: 07968 988442. To book or for further details: Info, Tel: 07968988442. A 6 week Absolute Beginners Course, then move up to Intermediates. What a fabulous, fun way to get fit and make friends! Our style is East Coast Swing, which came out in 1932. This style is also sometimes called Jitterbug, and was very popular in the 1940's. Later became the chosen style for early Rock'n'Roll music. Mostly partner dancing, but some is done on an individual basis, called strolling. You do not have to bring dance partners, but please bring friends, it is a social club! All Entries for Royal British Legion Venue. Stage. Small car park at the rear, entrance to the upstairs function room is the door furthest from the road in the car park. Rock 'n' Roll, East Coast Swing, Jive (50s & American), Jitterbug, Lindy Hop, Swing, Jive, Charleston Course, Instruction at Complete Novice to Intermediate level, Practice at Complete Novice to Intermediate level, Social Dancing at Beginner to Intermediate level. Doors open 19:30. Admission £7.00. £35.00 for whole evening. Licensed Bar. To book or for further details: Info, Tel: 07968988442. A 6 week Absolute Beginners Course, then move up to Intermediates. What a fabulous, fun way to get fit and make friends! Our style is East Coast Swing, which came out in 1932. This style is also sometimes called Jitterbug, and was very popular in the 1940's. Later became the chosen style for early Rock'n'Roll music. Mostly partner dancing, but some is done on an individual basis, called strolling. You do not have to bring dance partners, but please bring friends, it is a social club! Website. All Entries for Stoke Golding Club Venue. Car Parking. Stage. Doors open 19:30. Admission £7.00. £35.00 for whole evening. Licensed Bar. Non-Alcoholic Bar.To book or for further details: Info, Tel: 07968988442. A 6 week Absolute Beginners Course, then move up to Intermediates. What a fabulous, fun way to get fit and make friends! Our style is East Coast Swing, which came out in 1932. This style is also sometimes called Jitterbug, and was very popular in the 1940's. Later became the chosen style for early Rock'n'Roll music. Mostly partner dancing, but some is done on an individual basis, called strolling. You do not have to bring dance partners, but please bring friends, it is a social club!